We all know it. When you travel long term you’ll have your up and downs. I have a moleskin where I save all my personal traveling quotes that I want to remember for dark times or even when I need some travel inspirations. It helps me so much to stay positive and focused. Now I want to give you all my life quotes to motivate you. Some I stumbled across the internet and some I wrote for myself. They are my special life journey quotes. I don’t remember all the authors of the travel sayings, but that doesn’t matter. They all have a special meaning for me in some way and I’m pretty sure it will be for you too. Make a bookmark to this list, print it, share it or save it somewhere. There will come a time in your life that you’ll be happy to have some inspirational quotes. Enjoy. 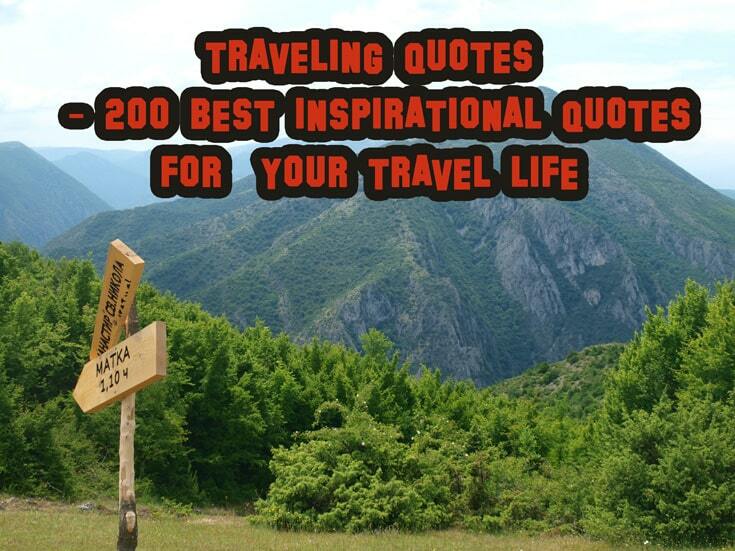 You can download the traveling quotes list here for free. 2. Every day is an adventure. 4. Stop dreaming. Start Living. 6. You are my happy ending. 7. 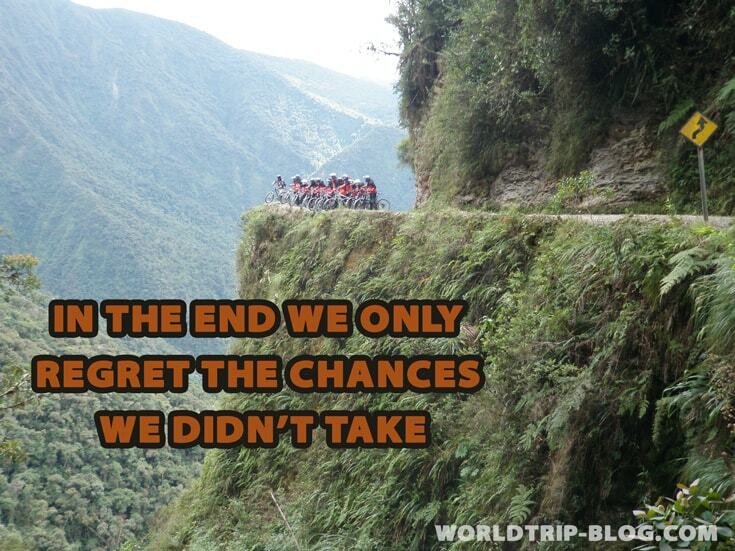 In the end, we only regret the chances we didn’t take. The picture was taken on the world’s most dangerous road. Bolivia. 9. Whatever is good for your soul. Do that. 10. Love and be here in every moment of your life. 13. All good things are wild and free. 15. Legend says, when you can’t sleep at night, it’s because you’re awake in someone else’s dream. 16. Be happy for this moment. This moment is your life. 17. Be the change you might see in the world. 18. One small positive thought in the morning can change your whole day. 19. If you want to fly, give up everything that weighs you down. 23. Peace in my heart. Peace in my soul. Wherever I’m going, I’m already home. 24. All that we are is the result of what we have thought. 26. When it rains look for rainbows. When it’s dark look for stars. 27. I haven’t been everywhere, but it’s on my list. 28. I’m going to see the world. 29. The world is a book. Those who do not travel, read only one page. 31. We are born to wander. 32. Happiness comes from the inside. 33. Stop consuming. Start giving. 34. The ocean is calling. 35. See the beautiful wonders in the world. The tree that is growing outside your house. The flower blooming in your garden. The sun shining through your heart. 36. It always seems impossible until it’s done. Nelson Mandela. 37. Happiness is not having a lot. Happiness is giving a lot. Buddha. 38. Every day is a chance to change your life. 39. Hear the sounds of the waves. Feel the sun burning your skin. Smell the flower blooming. Taste the water of the ocean. See the beauty of life. 40. Trust that an ending is followed by a beginning. 41. We must take adventures in order to know where we truly belong. 42. Wherever you are be truly there. 43. Just my path is different doesn’t mean I’m lost. 44. Forget all the reasons why it won’t work. Believe the one reason why it will! 45. Don’t rush anything. When the time is right, it will happen. 46. To live will be an awful big adventure. – Peter Pan. 47. A day at the beach restores the soul. 48. I would gladly live out of a backpack if it meant I could see the world. 49. At any given moment you have the power to say this is not how the story is going to end. 50. Strong people don’t put others down… They lift them up. 51. Collect memories. Not things. 52. Sometimes it’s best to be quiet. 53. Travel as far and wide as possible but always stay in the moment. 54. Feel it and you’ll love it. 55. You can shake the sands from your shoes but it will never leave your soul. 56. Take me to the ocean. 58. Nimm Dir Zeit for Dinge die Dich glücklich machen – Take the time for things that make you happy. 59. And I think to myself what a wonderful world. 60. When was the last time you did something for the first time? 62. You have to look up to see the stars. 63. Life is like a road trip. Enjoy each day and don’t carry to much luggage. 64. Getting lost is not a waste of time. 65. Wherever you go, go with all your heart. 66. You are a child of the universe. No less than a tree and the stars. 67. I can’t tell you the key to success, but the key to failure is to please everyone. 68. The future depends on what you do today. Mahatma Gandhi. 69. Realize deeply that the present moment is all you ever have. Eckhart Tolle. 71. Be who you are. Not what the worlds want you to be. 72. Only dead fish go with the flow. 73. The best view comes after the hardest climb. 74. One of the happiest moments in life is when you find the courage to let go of what you can’t change. 75. The tans will fade but the memories will last forever. 76. A flower does not think of competing with the flower next to it. It just blooms. 77. A journey of 1000 miles begins with a single step. 78. You don’t need to be rich to travel the world. 79. Focus on the good thing in life. 80. What you think you become. What you feel you attract. What you imagine you create. Buddha. 81. Don’t call it a dream. Call it a plan. 83. Don’t believe everything you think. 84. 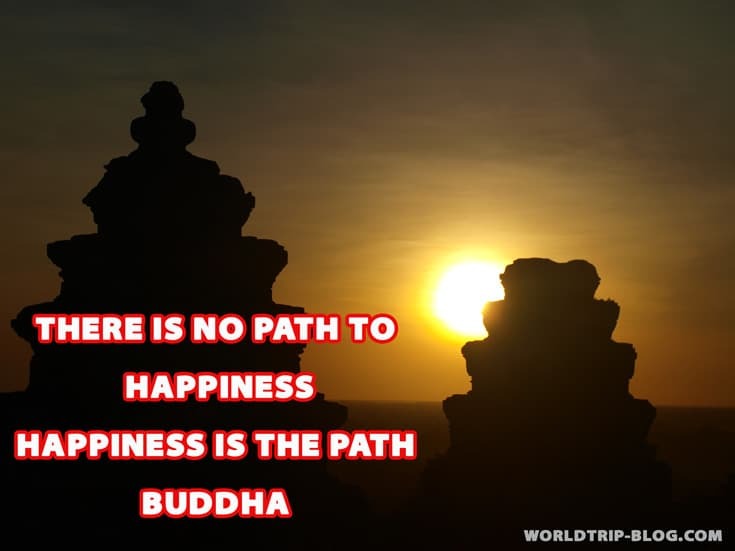 There is no path to happiness. Happiness is the path. Buddha. The picture was taken in Cambodia. 85. Traveling leaves you speechless, then turns you into a storyteller. 86. Don’t tell me how educated you are. Tell me how much you have traveled! 87. I have an adventure in my soul. 88. Of all the paths you take in life, make sure a few of them are dirt. 89. Put down the map and get lost. 90. She was like a moon. Part of her was always hidden away. 91. Some of the best memories are made in flip flops. 92. Don’t be afraid to fail. Be afraid not to try. 93. Look deep into nature. You will be understand everything better. 94. You must find a place in yourself where nothing is impossible. 95. It’s kind of fun to do the impossible. – Walt Disney. 97. Of all books in the world. The best stories are found between the pages of a passport. 98. The darkest nights produce the brightest stars. 99. A ship in harbor is safe. But that is not what ships are for. 100. 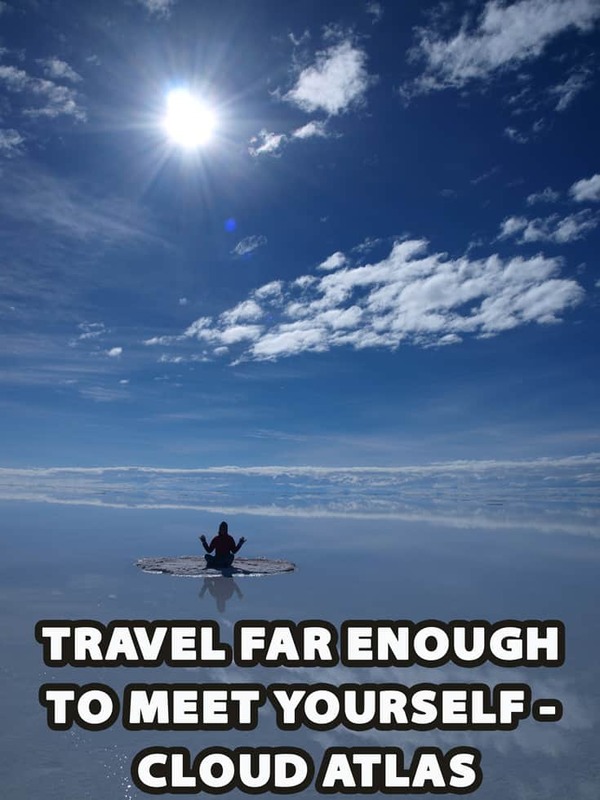 Travel far enough to meet yourself. – Cloud Atlas. 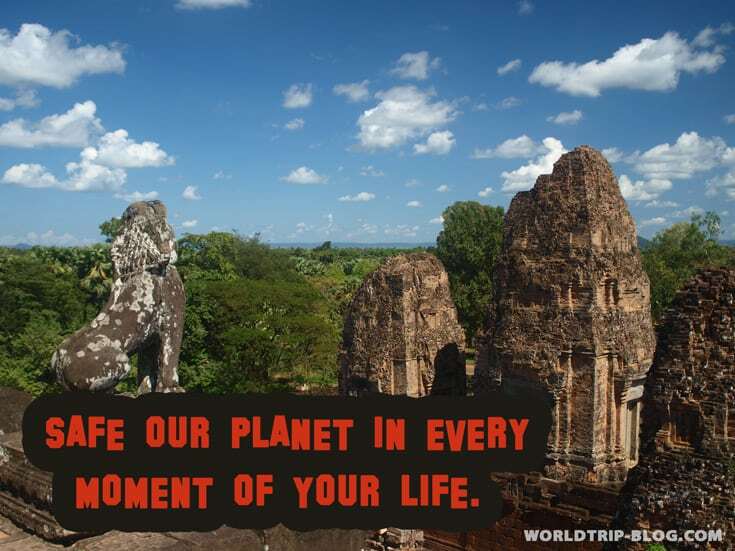 Inspirational traveling quote to motivate you. The picture is from Bolivia. 101. The best things in life are the people we love, the places we have been and the memories we have made along the way. 103. Keep your eyes to the horizon and the nose to the wind. 104. Your life is a road trip. 105. Once a year, go someplace you’ve never been before. 106. Everyone has a purpose in life… A unique gift or special talent to give to others. 107. The source of all creation is pure consciousness. 108. Become friends with people who aren’t your age. Hang out with people whose first language isn’t the same as yours. Get to know someone who doesn’t come from your social class. This is how you see the world. This is how you grow. 109. The real journey of discovery is not in seeking new landscapes but in seeing with new eyes. 110. Every memory is irreplaceable. 111. With you I am limitless. 112. You will never be completely at home again. Because part of your heart will always be elsewhere. That is the price you pay for richness of loving and knowing people in more than one place. 113. 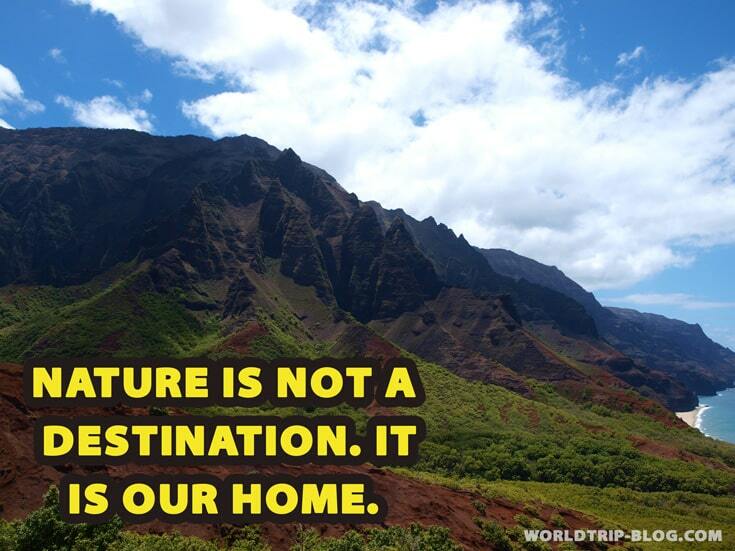 Nature is not a destination. It is our home. 114. If you light a lamp for someone else it will also brighten your path. Buddha. 115. Adventure is more than just driving. Wanderlust quotes. 117. Life is not a problem to be solved. 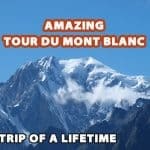 But an experience to be had. 119. My happiness is my responsibility. 121. Think less. Feel more. 122. Go crazy. Go wild. Feel free. Be yourself. 123. Can love create miracles? 125. Take only memories, leave only footprints. 126. Each morning we are born again. What we do today is what matters most. – Buddha. 129. The root of suffering is attachment. 130. Fear is not a reality. Fear is only in your head. 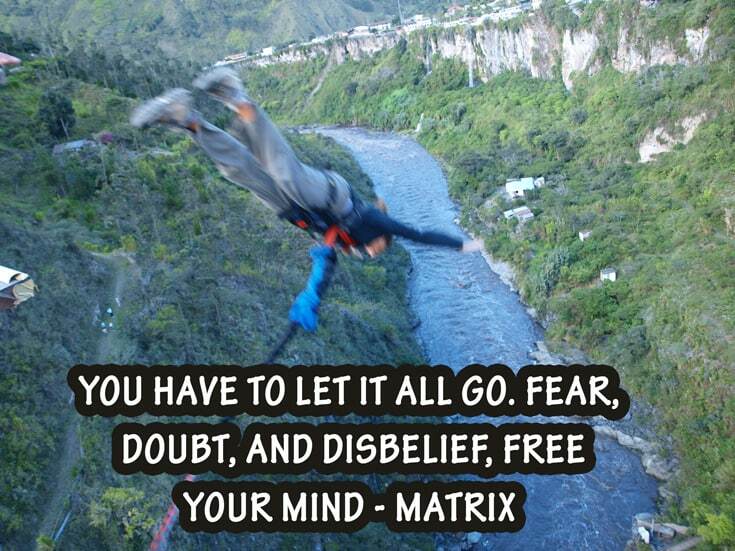 Let it go and be free. 131. The only thing what is sure is death. 133. Travel well. Travel often. 135. Our journey is about being more deeply involved in life and yet, less attached to it. 136. Your feet will lead you to where your heart is. 137. I do believe it’s time for another adventure. 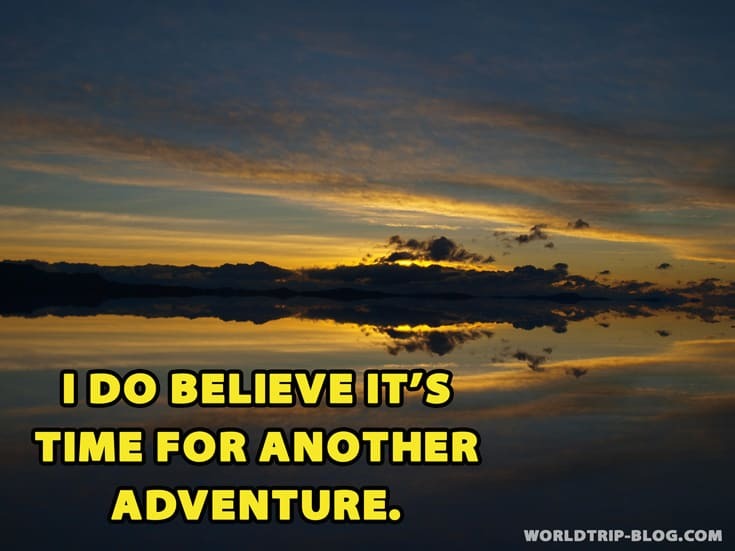 This is one of my favorite adventure quotes. 138. Be the change you wish to see. 139. Ach wie gut das niemand weiß, auf wen und was ich alles scheiß. 141. Seek adventures that open your mind. 144. Doubt everything. Find your own light. 146. When you realize how perfect everything is, you will tilt your head back and laugh at the sky. 148. Fall seven times. Stand up eight times. 149. The cost of not following your heart is spending the rest of your life wishing you had. 150. Hear to your heart. It beats before you were born. 151. In the waves of change. We find our true direction. 152. I can always learn new things. 153. One day people who didn’t believe in you will tell everyone how they met you. 154. Those who do not believe in magic will never find it. 155. Appreciate the little things. Life is full of it. 156. A wise man never knows all. Only a fool knows everything. 157. The most painful goodbyes are the ones that are never said and never explained. 158. You are a diamond. They can’t break you. 159. Die with memories. Not dreams. 160. An emotion is the body’s reaction to your mind. 161. All problems are illusions of the mind. 162. If it scares you it might be a good thing to try. – Seth Godin. 163. Your wings already exist. All you have to do is fly. 164. Accept it and wait for the miracles. 165. Life is the dancer, and you are the dance. 166. Time is an illusion. 167. The primary cause of unhappiness is never the situation but your thoughts about it. 168. Be wide and open. 169. Open your eyes. Open your heart. Open your mind. Or everything will close. 170. Stay here and be here. You are responsible for your destination. 171. Bring love into this world. And in the next. Again and Again. 173. Your mind makes it real. 175. If real is what you can feel, smell, taste and see, then ‘real’ is simply electrical signals interpreted by your brain. 176. I can only show you the door. But you have to open it. 178. I don’t want to survive. I want to live. 179. Everything will be okay in the end. If it’s not okay, it’s not the end. John Lennon. 180. Believe you can and you’re halfway there. Theodore Roosevelt. 181. It is never too late to be what you might have been. George Elliot. 182. Creativity is intelligence having fun. Albert Einstein. 184. Where there is love. There is life. 185. A friend is one that knows you as you are, understands where you have been, accepts what you have become and still allows you what you’ve become. Elbert Hubbart. 186. Never ever give up. 187. Travel, Love, Swim and Smile. Walk and be there. 188. When I see the sun I look into myself. I see the sun in every creature, in every flower and tree. We are all the universe. 189. Walk and feel every step you make. 190. You don’t have to travel far away to see the wonders. 191. You have the wonders inside you. You just have to look at it. 193. Go far away. But don’t forget your mind. 194. There must be a place in this world where I feel at home again. Look inside you. 195. We cannot be sure of having something to live for unless we are willing to die for it. Ernesto Che Guevara. 196. Only those who will risk going too far can possibly find out how far one can go. T.S. Elliot. 197. True forgiveness is when you can say, thank you for that experience. Oprah Winfrey. 198. We cannot solve our problems with the same level of thinking that created them. Albert Einstein. 199. Life begins at the end of your comfort zone. Neale Donald Walsch. 200. Safe our planet in every moment of your life. Thank you for reading it. I hope you enjoyed it. If you want more travel quotes you can look at my pinterest site. I added a group board where I save some funny traveling quotes as well. If you have your own favorite quote and want to stay on this list above. Contact me. 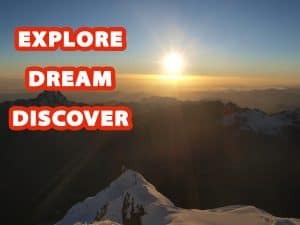 If you want to get more inspired, check out my free newsletter and get my travel quotes list for free too.